The Venture Ambassador Shuffleboard Table is a world class shuffleboard table designed for the North American Shuffleboard Championships and the World Championship Tournament. The hard rock maple shuffleboard table playing surface is an incredible three inches thick and is coated seven times with a hard clear synthetic lacquer, for ultimate durability and smoothness. The elegant tapered pedestal style legs are easily adjusted for leveling with a wrench. Everything you need to get started playing shuffleboard is included: shuffleboard pucks, shuffleboard wax, shuffleboard polish, and shuffleboard silicone spray. 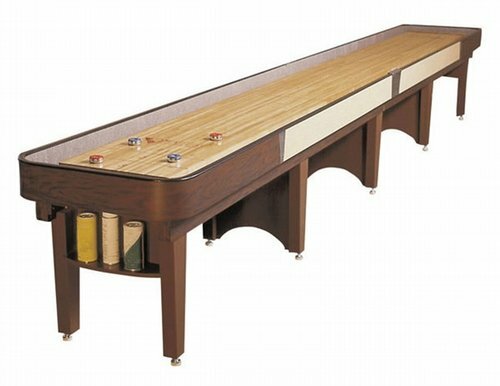 This shuffleboard table combines masterful craftsmanship and dedication to quality to create a game table designed to be a permanent fixture of fun in your bar or home game room. This is a special order item and will take 3-6 weeks for delivery. The prices below includes curbside shipping to most locations within the 48 contiguous states. Please read our shipping policy for full details. Optional Scoreboard: Select One 13" Scoreboard - Add $695.00	18" Scoreboard - Add $895.00	24" Scoreboard - Add $1,095.00	No Thanks! 10'10" x 20" x 3"
12'10" x 20" x 3"
16'8" x 20" x 3"
18'8" x 20" x 3"
20'8" x 20" x 3"